Your Positive Thought Daily - Are you a profit or loss Entrepreneur? Are you a profit or loss Entrepreneur? Deciding your place in the business profit market is a nostalgic choice that comes from years of your past emotional conditioning. Yes you are the decider of your profits, not your product or your business but you the business owner and employees. Read more: Your Positive Thought Daily - Are you a profit or loss Entrepreneur? Each of you are seeking the same as the next – an ease of profit to improve and maintain a quality of life. This is a repeated thought and action for most business’s and for much it’s a sold out and dated emotion. So let’s change that perception for you through our EETA coaching programmes and make your business life easier and richer in success and profits. What’s your financial contentment of your business? What’s your financial contentment of your business? Is it a business that makes a profitable profit or a business that makes a wage? Which bracket of worth do you and your business sit? No more kidding yourself and conjuring up the daily excuses and lost pipe dreams of “I’ll be successful one day”, and let’s not forget the favourite excuse “I’m happy where I and my business is financially, it gets me by”. Over the years I have heard so many pitiful excuses for depleted and stale business ventures, many contenting for fear over fortune and investing into the stand still acceptance of “I’m happy to make a wage and I don’t need millions” If this thought is the case for you, while this may be all well and fine, have you forgotten one major factor here, and here’s the highlighter thought for you: a business module has one purpose and one purpose only, to offer a service/product of such quality it turns into profit and then to grow and introduce a greater product to increase profits and keep repeating the process, how easy is that. Now this is where you come in, the business owner, you see the product is not your sale item or sale service as that is just the reasoning for your business, the product is YOU. You are the sale to the sale. Would you by you? Are you worth buying? How much would you pay for you? What’s the likability value of you compared to your sale product (you should always be more). Behind every successful business there is a well thought after business owner/leader, an individual that naturally attracts clients and increases business success like metal to magnet, and without too much effort. How does one achieve this state of attraction? By understanding and working on the emotional value of themselves. 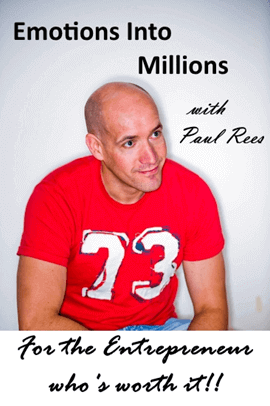 Investing into one of the richest assets one can own “Self-worth”, an ingredient that your corporate emotional intelligence craves daily and it’s this that I Paul Rees executive business coach can, through my highly successful EETA business coaching programmes bring true to your life story. Millions in profit is easy and equal to all not just the few. Start your new success in your established business and make contact with me today for your free one hour consultation via skype, facetime or visit our local office. I coach internationally and work with clients all over the world, so am never too far away to help. Its time you tasted success and removed the stress of trying too hard. For the business owner or career minded person - What is my success now? Business and success come married from one ingredient of knowing and that is – Do you feel worth it? To achieve this knowing and the abundance of repeated sustainable success in business start by asking yourself some simple questions (see below). Which one of the five questions reflects your position at this point in time, because the belief of your success will always come second to the belief of your self-worth that is made up of thousands of micro emotions that are your build of emotional person? It is true to say in business, all carry the belief of success but yet the practice of the business on many occasions reflects otherwise. Answer your question ego free, be true to your current position because the way forward is to understand and grow from the now of your life. Recognising your true current position will create the correct rational foundation to your long term goals. Read more: For the business owner or career minded person - What is my success now? Finding your BUSINESS/CAREER all over again! Take a good hard look at what is working for you and what is not. Remember we are creatures of habit and for the most part, repeat daily the same emotional hold backs because it is what feels safe. A self-inflicted hold back in life is always an emotional trait inherited from our youth via our parents. Read more: Finding your BUSINESS/CAREER all over again! For the business owner and new start up - Success IS easy!! Accolade Academy’s unique corporate training and coaching can offer so much for the success of your start up or the increased success of your established business. We specialise in helping the new entrepreneur establish the self-confidence and worth that’s absolutely necessary for any business to succeed successfully in this day and age. Read more: For the business owner and new start up - Success IS easy! !